"Written with great clarity and intelligence, this book will be of benefit to all mental health practitioners, students of psychology, and those seeking a better understanding of their own process of psychological and spiritual transformation." "In this wonderful book, Rick Johnson weaves together different theoretical perspectives in a way that welcomes religion, spirituality, and nature into the counseling and psychotherapy process. It's a delight to read Dr. Johnson's approach—an approach that teaches therapists how to empathically explore spirituality as an important dimension of human existence." "Rick Johnson's book Spirituality in Counseling and Psychotherapy is a rich introduction to the varied forms in which spiritual suffering enters the consulting room, the range of theories which address or fail to address this need, and specific attitudes and practices through which therapists can provide a non-doctrinal but open encounter with the spiritual needs of their clients." While many clients want spiritual and philosophical issues to be addressed in therapy, many mental health professionals report that they feel ill-equipped to meet clients' needs in this area. Providing a model that is approachable from a variety of theoretical orientations, Spirituality in Counseling and Psychotherapy supports therapists in becoming open to the unique ways that clients define, experience, and access life-affirming, spiritual beliefs and practices. 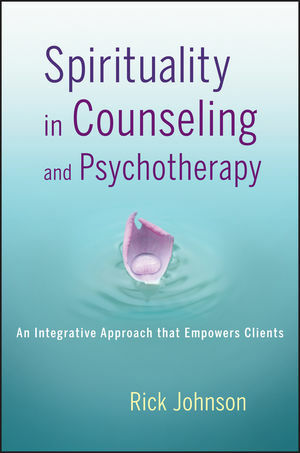 Filled with numerous cases and stories illustrating how spirituality can be a natural and beneficial part of the therapeutic process, Spirituality in Counseling and Psychotherapy enables mental health professionals to nonjudgmentally invite a collaborative exploration of the role of spirituality in their clients' lives. PATRICK "RICK" JOHNSON, PhD, is Department Chair of the Counselor Education Department at Portland State University. Previously, he was an assistant and associate professor at Montana State University. Dr. Johnson is also a licensed psychologist and maintains an active private practice. His research and scholarly agendas focus on the effects of family experiences on psychosocial development in adolescence and adulthood, as well as the integration of psychological and spiritual health.